Moonlight has revealed a massive 2015/16 season, with the January and December film program announcing advanced screenings of over 15 of the hottest new releases to be seen under the stars, before they even hit cinemas. Across Sydney, Melbourne, Adelaide from 03 Dec, Perth from 05 Dec, and Brisbane from 16 Dec; the Moonlight team are fluffing the bean beds and getting ready to hoist up giant screens. Summer nights don’t get much better than this! Star-studded VIP red carpet advance screenings of Suffragette, in Sydney, Melbourne, Perth and Adelaide; starring a trifecta of acting royalty: Meryl Streep, Carey Mulligan and Helena Bonham Carter; will officially open the season. For the mini movie buffs, advance screenings include: the latest epic animation adventure The Good Dinosaur from Disney Pixar, as well as everyone’s favourite childhood book franchise turned silver screen smash hit, Goosebumps, starring the monstrously funny Jack Black. Cult classic cravers will love the line-up of favourites includes Dirty Dancing, Top Gun and Ferris Bueller’s Day Off. Tell me more, tell me more I hear you say? There’s also a Grease Sing-a-long. Doggie Nights return with four puppy friendly flicks in Sydney, Melbourne, Adelaide and Brisbane Moonlight Cinemas. Previews of Snoopy and Charlie Brown: The Peanuts Movie, comedy gold flick Sisters, Ferris Bueller’s Day Off, and for canines with a Daniel Craig crush, Spectre welcomes furry friends into the adventure. 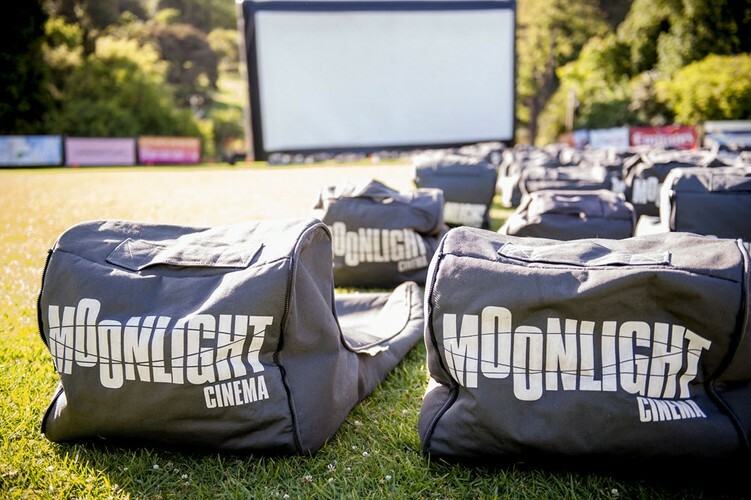 As always Moonlight cinema is a BYO friendly event, but no sweat if you forget your picnic spread and sparkling; Moonlight’s famous LA style food truck and fully licensed bar, will be serving up tasty treats for all appetites. Audiences can tuck into a scrumptious menu of movie munchies including pulled pork sliders, New Yorker chilli cheese dogs, buffalo fried chicken, parmesan truffle fries and fresh Nutella donuts. There’s something for absolutely every kind of movie maniac and film fanatic at this season’s Moonlight Cinema. Gates are open an hour and a half before the film starts so grab all your mates, snap up your grassy patch and lay back for a summer of fun, food and films under the stars!